We’re deep into what I call Three H Summer Weather – Hazy, Hot, and Humid. The type of weather that makes a sun dress the most appropriate way to stay cool (while still looking cute!) which you can barely find in a store because it is full of Fall Back to School clothes and gear. 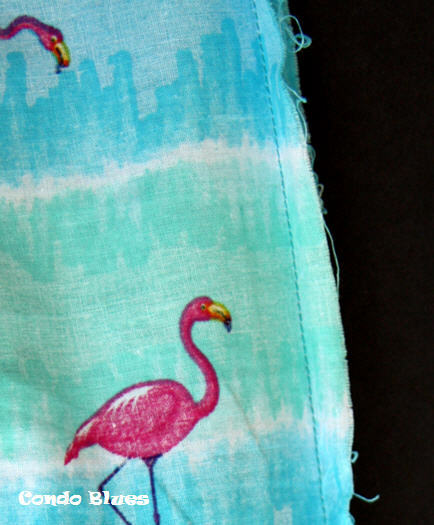 Fortunately, while shopping for costume fabric, some pre- shirred and pre-smocked with elastic flamingo fabric caught my eye. I adore flamingos! Most of work was done for me and the kids maxi length fabric is just the right length for my wee 4’11 frame to be a sundress to the knee. I popped the bolt in my cart and starting shopping for the actual reason I went to the fabric store in the first place. As I shopped, I put the fabric back on the shelf since I was drawn to it only because I have a made crazy love of all things flamingo. It’s an impulse item and I’m trying to stick to my shopping list. Later I went over and put the bolt in my cart. I do need some summer clothes. I can wear to the annual luau! The amount of fabric you need to make this practically no sew dress is your bust measurement minus a few inches so the finished elastic top stays up when you wear it. 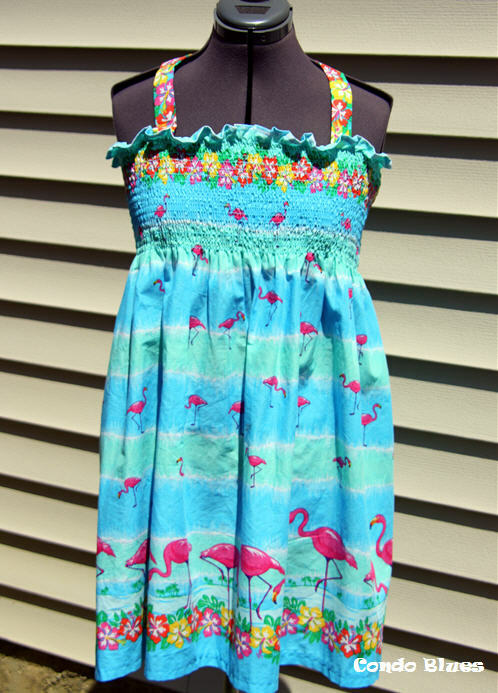 You can use this tutorial to make it a sleeveless sundress, or you can add ribbon or fabric straps if you like, it is up to you. I added halter straps to the top of my dress otherwise my top won’t stay up top where it belongs without a heaping helping of crazy glue every time I wear it. Tie straps are much more comfortable than glue so that’s what I’ll do. 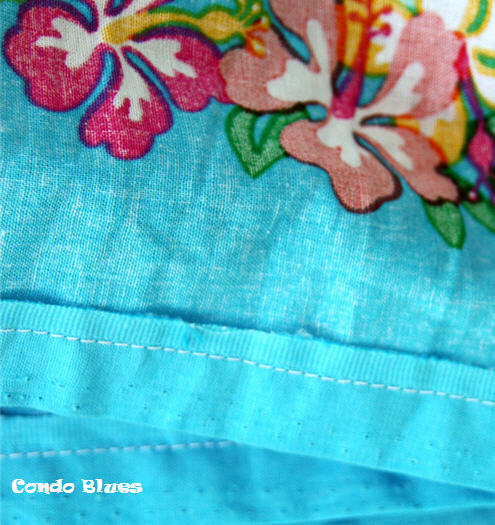 Pre-Smocked Shirred Flamingo Fabric - this is the fabric I used. I get compliments on my dress all of the time when I wear it. Also, FLAMINGOS! I’m always thinking about my amazing readers like you and that's why I share supply ideas like these. When you get this goodie, I might get a few coins thrown my way that keeps me supplied with enough coffee and household electricity to keep bringing YOU free DIY ideas like this every week. Thank you for your support! 1, Fold the fabric in half lengthwise right side (the pretty part) facing in and pin it into place. Sew one straight line and BAM! You're done! 3. Use the iron and ironing board to iron the seam flat. This way the fabric will lay better when you wear it. 4. Hem the dress to length as/if desired. I added a little hem by turning the fabric in on itself and sewing it into place. Luckily this is the finished selvage edge and won’t ravel, otherwise I’d have to turn the top edge over on itself and sew it into place. I trimmed the fuzzy fringes off the selvage edge to make it look neat, since I didn't have enough fabric for a proper twice turned over hem. 5. 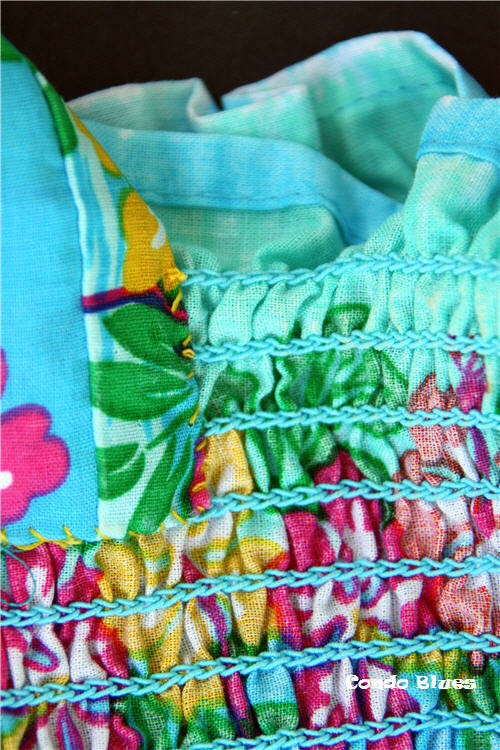 Optional straps: Cut two pieces of ribbon to your desired length and sew them inside the top of the dress. I used the seam technique in Steps 1 and 2 to make straps from leftover fabric instead of ribbon and hand sew the straps into place. 6. 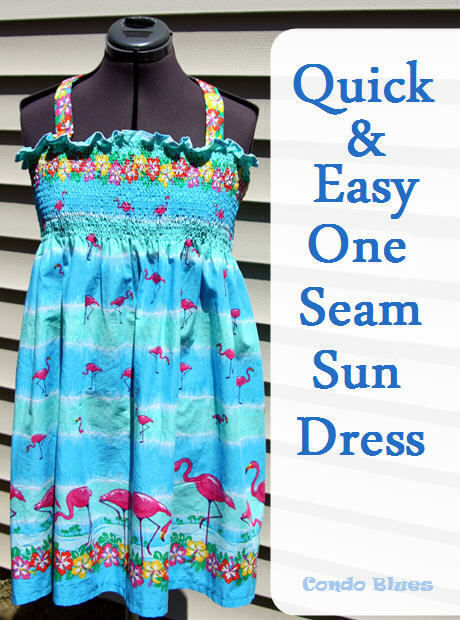 Wear your super easy sundress and look cute! The dress straps tie behind my neck.